Lessig on Swartz is here. Godwin's Law should be expanded to cover this misuse of a tragedy to dramatize a totally unrelated and dubious set of accusations. If there is any lesson to be learned from the Swartz case it is that prosecutors are not to be trusted with "discretion," and therefore that laws making vaguely defined conduct a felony are very bad ideas (because the people who will be interpreting and using them against people are not at all like you). Any laws which could possibly be used against "Wall Streeters" are certainly examples of that problem. Thanks for you comment. 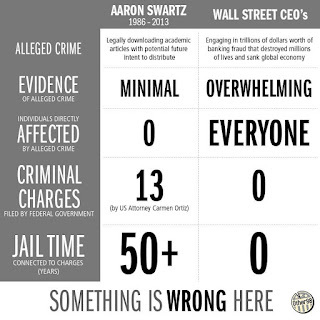 I guess I would say charges against bankers COULD BE examples of the problem, depending on what actually was filed. When dissent utilizes the tools of propaganda does this function as a useful means of fighting fire w/ fire, or does it reinforce the larger problem of a culture lost in the spectacle of an us vs. them narrative? Surely a range of all answers, up, down, and all around a gradient spectrum, dependent upon a multiplicity of mitigating circumstances, too intertwined to discern, understand, or often even detect! In my deep underground press days I circulated an antiwar 9/11 mindfuck publication, starring RAW, in which I knowingly included suspect factoids that I felt contributed to my big picture world peace agenda. Back then I felt certain this style fixed more pickles than it made, I still think maybe it can get used artfully, but it's a policy under continuous careful review! I'm sensitive to John David Galt's criticisms, too. 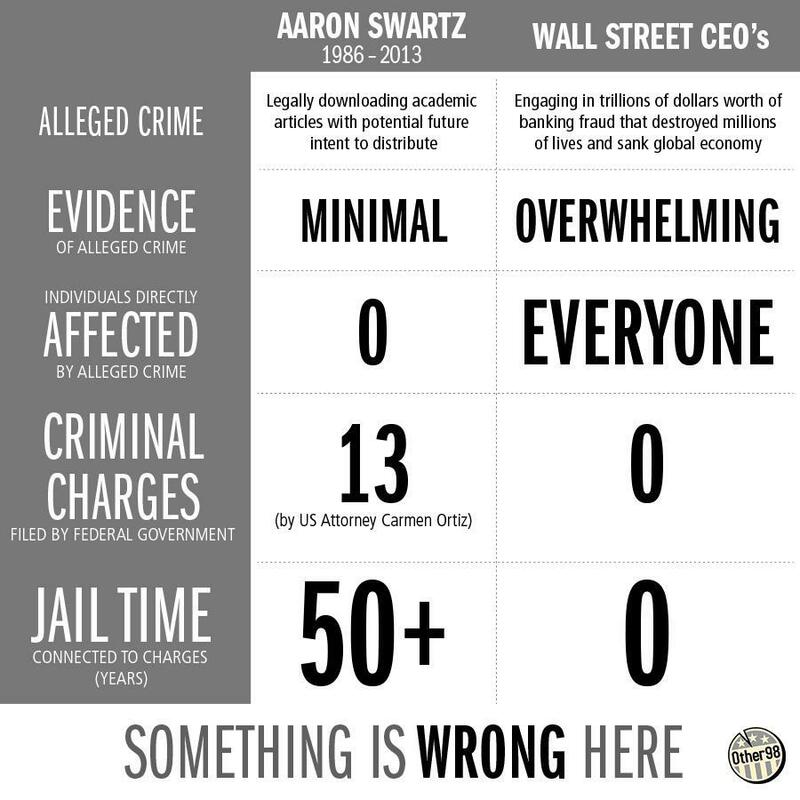 I guess I think the graphic dramatizes the overreach in the charges against Swartz; don't know if I'd go beyond that. Very fair enough! I sometimes get carried away venting my uncertainties. Thx for reply.